My beloved man spouse is celebrating his 29th birthday today! 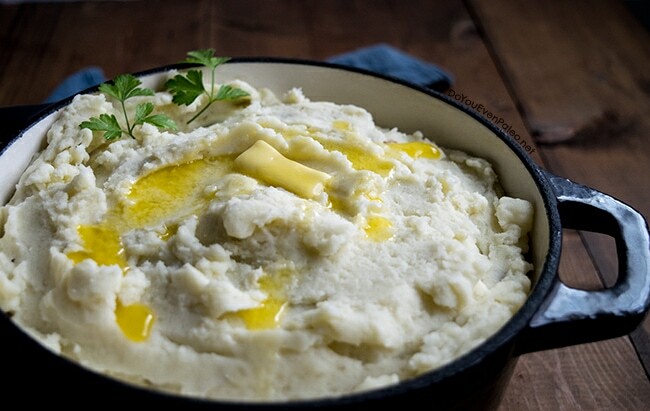 I thought we’d celebrate on the blog with his favorite food: Legit Whipped Mashed Potatoes. When I was a child, Mom was the main cook in the house. Sure, Dad “cooked” when my mom worked late, but that typically involved spontaneously tossing the contents of various canned foods together to create something that was sometimes palatable and sometimes…not. But there was one exception when it came to family meals. My dad always made the mashed potatoes. 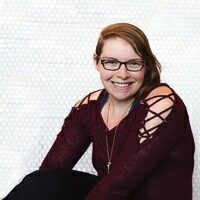 Eventually I learned what was behind the arrangement. 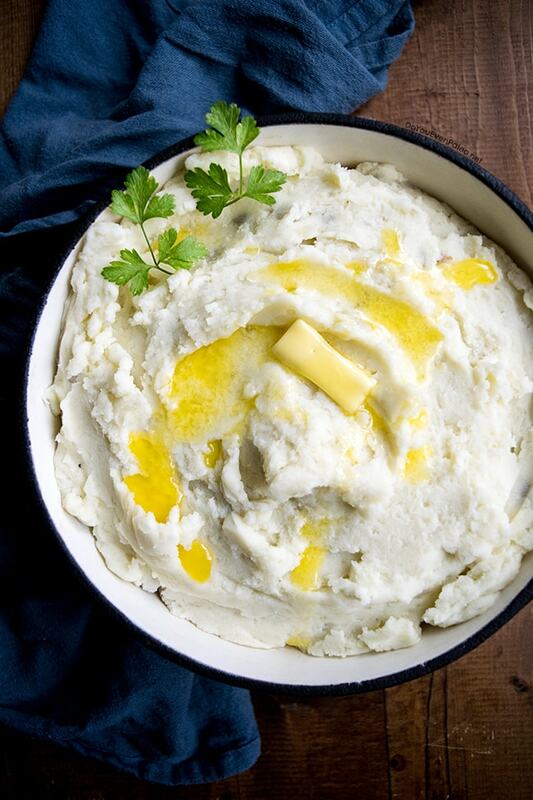 Dad never really learned to cook, but he discovered at a very young age that he adored mashed potatoes. As he got older, though, he grew frustrated with the “instant” crap many restaurants served. He knew in order to have great mashed potatoes, he had to learn how to make them himself. I like to imagine he tested out all the various methods he could find while he was working in a potato factory in Idaho (it’s true that he worked in a potato factory in Idaho, but I’ve never asked when he worked on his mashed potato recipe). Anyway, once he made whipped mashed potatoes, that was it. Nothing else would quite do for him. So even after my dad met my mom, mashed potatoes were always his duty in the house. To this day, Dad still makes the mashed potatoes for every Christmas, Thanksgiving, or other holiday meal. Of course, he makes four times more than anyone will have room for to ensure he has enough for his “dessert” helping! My husband is a little more open-minded with his love of mashed potatoes. He’s happy with the standard, shortcut mashed potatoes I typically make. But since today is his birthday, I’m busting out the big guns with my dad’s basic method. In my parents’ house, whipped mashed potatoes can stand on their own. 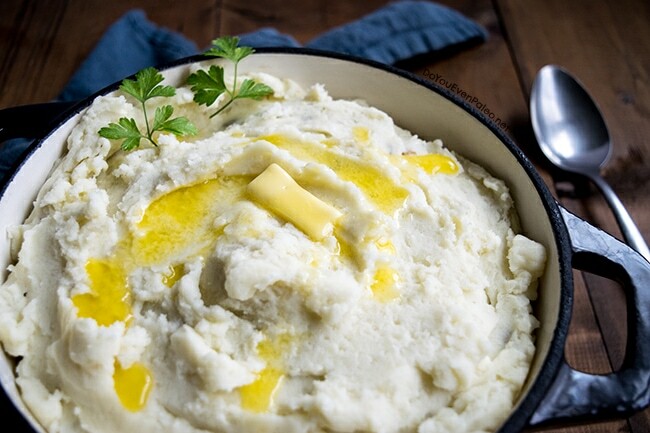 You don’t need add-ins or gravy or anything extra to make good mashed potatoes. 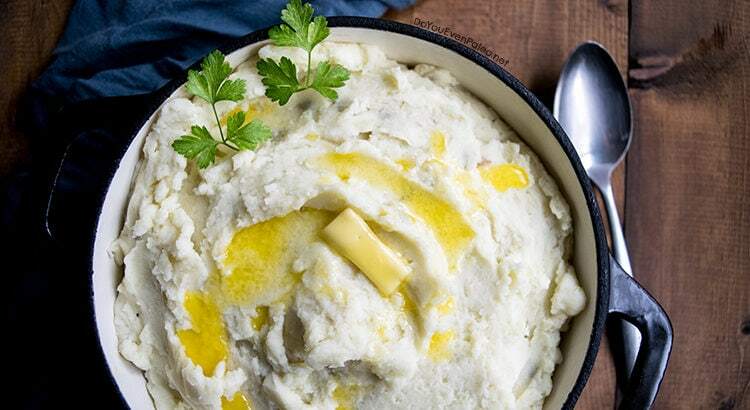 Put simply, these mashed potatoes are legit. There are some basic things to know, though. Russets are the best for mashing. They’re widely available, not too expensive, and starchy. 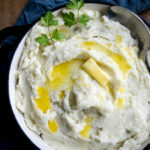 Starchy potatoes are key for good, fluffy mashed potatoes! Once you’ve got starchy russets on hand, you need fat. 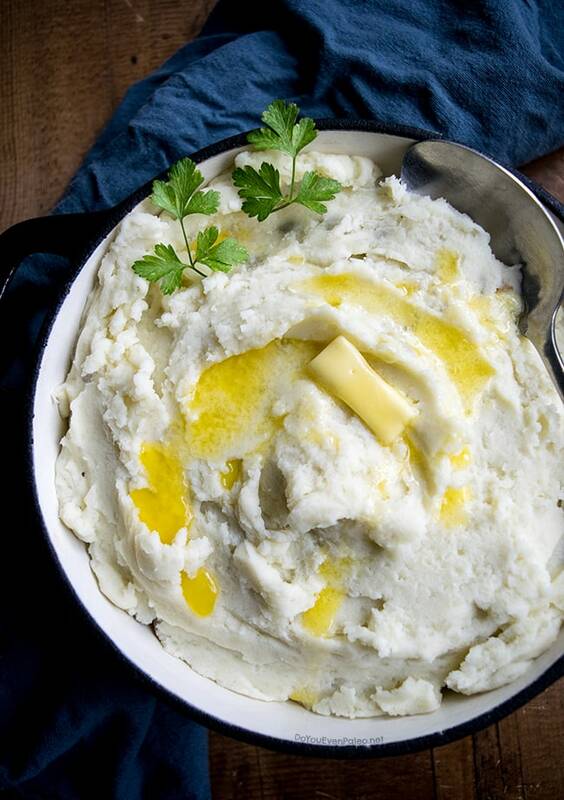 Simply put, mashed potatoes are best with fat. That’s why this recipe uses butter and cream (or ghee and full-fat coconut milk, for a dairy free and paleo option). Use reduced fat milk, broth, or other nut milk and you just won’t get the same results. Sure, you can use any of those as substitutes, but it’s my husband’s birthday, remember? Gotta indulge a little. Another note on the coconut milk. Using coconut milk will change the flavor. I considered not including that sub at all, because the two outcomes are not the same… but when I subjected Tjay to a blind taste test, he actually rated the coconut milk version the highest. Totally blows my mind, since he typically claims he hates coconut milk in savory dishes. Finally, whipping the mashed potatoes takes seconds. It’s important not to overmix them or they’ll become gluey. Whip them only as long as necessary to combine the cream with the potatoes and fluff them up. Then you’re done! Any mix-ins you want to use like chives, rosemary, tarragon, chile oil, avocado, bacon, etc. can be folded in with a spatula after they’re whipped. Let’s get to cooking, shall we? Peel the potatoes and cut them into quarters. Add them to a medium-sized pot and fill with water until the potatoes are completely covered. Bring the water to boil over medium-high heat. Let boil gently for about 20 minutes, until the potatoes fall apart easily when you pierce them with a fork. Lower the heat to low. Drain the potatoes over a colander and give them a shake to remove excess water. Add them back to the pot along with the butter and salt. While the butter is melting, mash the potatoes with a potato masher (that sounds redundant, doesn’t it?) until the butter is completely melted and no large chunks remain. Transfer the mashed potatoes to the bowl of a stand mixer. Add the cream. Whip the potatoes on medium-high speed for 10 to 20 seconds, just until the potatoes are smooth and fluffy. Be careful not to overmix! Taste the potatoes—if they are too thick for your liking, add more cream 2 tablespoons at a time and whip for a few seconds to incorporate. Stir in any add-ins (chives, rosemary, etc.) with a spatula and serve. Don't subscribe All Replies to my comments Notify me of followup comments via e-mail. 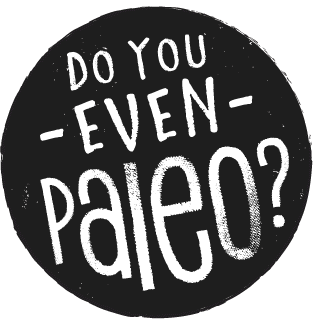 You can also <a href='https://www.doyouevenpaleo.net/comment-subscriptions/?srp=2367&srk=87505361eee98908ddf6ccb8681f50d6&sra=s&srsrc=f'>subscribe</a> without commenting.